DSH Genius 5000 Handheld XRF Alloy Analyzer - Buy Handheld XRF Alloy Analyzer, XRF Alloy Analyzer, Top XRF Alloy Analyzer Product on Dshing Instrument Co.,Ltd. It can accurately analyze all kinds of high &low alloy,stainless steel,tool ateel,choromium/molybdenum steel,nickel alloy,cobalt alloy,nickel/cobalt hest resistant alloy,copper alloy,bronze,zinc alloy,tungsten alloy etc.Through determination of other alloy elements,it also can identify the light alloys such as Al,Mg and can be used for reliable identification and confirmation of material.It can be applied for incoming material determination in iron and steel smelting,boiler and other high-temperature and high-press industries,to ensure the quality of the material.It also can be used for alloy content analysis in shipbuilding,aerospace and other high -tech industries,to ensure the quality and safety of the product.It can be applied in power plant and other national ecnomy and people’s livehood industries for components determination and safety of the devices. While according to scrap metals recycling and utilization industries,it can quickly analyze and categorize a large number of scrap metals,offering the necessary infromation for both sides in purchasing and selling.It is the powerful weapon for metal and steel identifiction in renewable and resuage of scrap metals resource industry,which greatly contributes to the development of resource recycling industry.It also can be applied for recovery of steel backlogged in warehouse,classification of various metals in salvage station,and cutting of turnery and debris. Introducing three core technology of small power window integrated miniature X-ray tube, large dimension beryllium window electric-cooling SDD detector(the best detector in the world), and miniature digital signal multi-channel processor, greatly reduce the testing time and test deviation,and improve the detection precision, which make it have the similar performance as the desktop. Small body. Easy to carry. Convenient for wild work. Can operate on-site and in-situ analysis at anytime or anywhere. 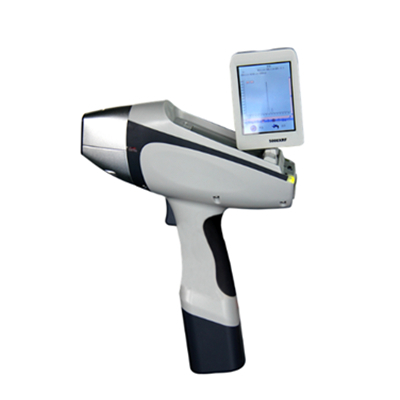 Instrument not only can operate fast detection with handheld type within 1-2 seconds, but also can operate longtime precise dedection with desktop type, having the similar precision as the laboratory detection after 10 seconds. Compared to handheld X-ray fluorescence analyzer of the third generation, it is added the gas charging system, which can charge helium at ordinary pressure.Thus it can detect the elements from Mg, greatly expanded the detecting range of elements, satisfying the requirements of customers according to light elements detection. It can detect the analytes directly, no need of smaples. It can analyse various kinds of samples, including electronic products, alloy samples, geological and mining, soil, rock, residues, small solid particles, liquid sediments etc. Built-in HD camera, can observe the testing position at any time, which is very important of mineral smaple testing. Multi-testing modes installation and free adding of infinite modes, coordinating with automatic testing mode matching function, it achieves the esay test for one key. Built-in intensify calibration methods, it can calibrate the deviation caused by different geometry shapes and inhomogeneous structure density. RoHS elements analyzer, alloy analyzer, mineral analyzer , and heavy metals in soil analyzer all are installed with professional software.Brand new software interface and core, combined FP with EC, it has wider application fields. On the basis of the combination of collimator and filter, increase them from 4 groups to 12 groups, increasing 3 times. Embedded Window CE system, HD touch screen (resolution 640*480), digital multi-channel technology, and SPI data transmission, effectively improve the data transmission ability and counting ability, mastering testing data in every environment. Triple safety protection function, automatic sensation, automatically shut-down of X light pipe within 2 seconds with no sample in testing; The radiation level is far lower than the international safety standard when working, with no radiation leakage; accompanied with test safety cover. Lithium battery, with maximum capacity of 7800mAH, can continuously work for 8 hours, whose endurance are 2 times longer compared to last three generations.And equip with wide voltage ac charger or vehicular charger,which ensure the test at any place or any time. Equiped with warning instruction system, green light flashes when the power is on and the yellow light flashed when testing, which prevent for mistaken operation. The instrument has waterproof and dustproof function and can continuously work under high temperature and humidity. Its protection boxes are manufactured with high strength military material, which enjoy with well moistureproof, shockproof, and pressure resistant functions. 2 Analysis method Energy dispersive X-ray fluorescence analysis method. 3 Measuring range of elements Mg to U. 4 Analyzing ability Simultaneously detect tens of elements. Standard configuration: 2G , can store large amounts of data. 7 Testing time 3-30 seconds. general adapter, can work under alternating current. 10 Testing object Solid, liquid , powder. 11 Detector 25mm2 0.3mil, SDD detector. 12 Detector resolution Lowest resolution can be 139eV . 13 Excitation source 40KV/100uA-Ag anode window miniature X light tube and high voltage source. 14 Collimator and filter Collimator of 4.0 or 2.0 diameter, automatic switch of 6 types filter groups. 12 kinds of groups, can satisfy various kinds of samples testing. 15 Video system HD camera. 16 Screen TFT-LCD touch screen, resolution 640*480. 17 Detection limit Lowest detection limit accounts to ppm level. 19 Safety Self-contained password manager mode. 20 Gas charging system Helium charging at ordinary pressure system. counting rate, waterproof miniature USB,which can be connected to desktop computer. 24 Size 234×306×82mm( L×H×W) . 25 Weight 1.9Kg( with battery) , 1.6Kg( without battery) .